The truth of the matter is that I have reaped so many benefits from my yoga and meditation/mindfulness practice that yes, I would love for my entire family to practice on a daily basis with me. I will say, my daughter does enjoy going to class with me when she is not hanging with her friends. My son well, I think if he could teach the class he would practice yoga. And my husband would rather play his guitar. I have discovered a way to incorporate yoga into my son’s life. After attending a 1 day Workshop on Yoga 4 Classrooms in which I received this lovely deck of cards, my son and I started our Yoga Minutes. In the morning just before going out to the bus stop, he chooses a card or two. The cards have a pose and a description of how to do the pose as well as benefits of the pose. There are also various visualizations and breath practices in the deck. He and I look forward to choosing our card and, giggling always becomes part of the practice too. Another tool for mindfulness in our mornings is an app I have on my phone that I can set to chime at certain times. When we hear the chime, we stop what we’re doing and take a breath or do wiggly tree. 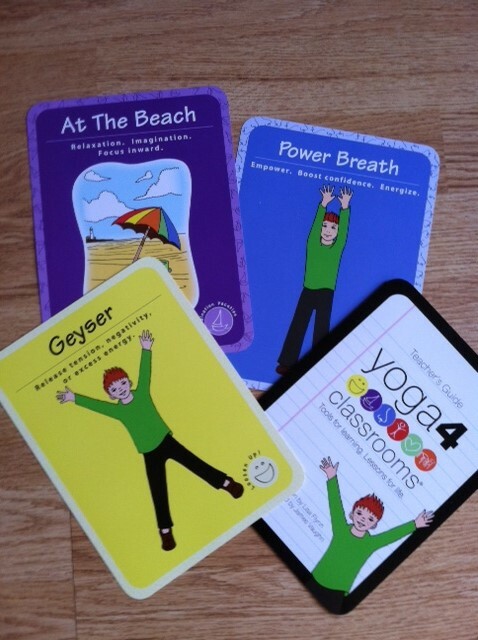 These Yoga Minutes have proven to be a great way to incorporate mindfulness and yoga into my son’s life and mine. My hope is that these minutes will provide him with tools for his daily life to manage his emotions and the stresses that children incur in this hectic world of ours. I would love to hear in the comment section how you and your family incorporate yoga and mindfulness into your lives.